Eddie Redmayne plays a convincing Stephen Hawking in James Marsh’s “The Theory of Everything.” He is shown above with Felicity Jones as his wife, Jane. James Marsh’s “The Theory of Everything” is part love story and part biopic, but sadly doesn’t highlight enough of either. Having bawled at the trailer twice, I went into this movie with high hopes, but felt like I was being led too quickly through a man’s life, peering into each formative chapter and craning my neck to see more before being jerked on to the next. 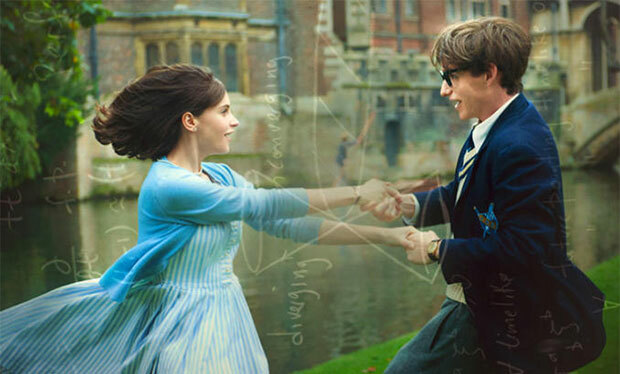 However, brilliant acting on the part of Eddie Redmayne as Stephen Hawking and Felicity Jones as Jane Wilde, as well as Marsh’s sleek direction, make up for the film’s often scattered, surface-level aspects. Before Stephen Hawking was Stephen Hawking, he was just “Stephen:” a God-defying, physics Ph. D. student at Cambridge who fell in love with his opposite — religious Jane Wilde — a woman of the humanities. After meeting at a student event and attending the May Ball together, the two fall in love. Tragically, as he prepares to present his doctoral dissertation, Stephen discovers that he has a fatal motor neuron disease with a life expectancy of two years. He attempts to withdraw from his friends and from Jane, but she vows to stay by his side. The story then goes on to explore his later achievements, Jane’s loneliness and frustration with their marriage and their eventual separation. That being said, Eddie Redmayne and Felicity Jones give phenomenal performances. Redmayne plays both the witty, able-bodied young Stephen and the older, infirm Stephen, who preserves an effervescent sense of humor despite his condition. He so magnificently conveys the angry helplessness of a man who finds himself unable to play a game of cricket, and the fierce determination of the same man crawling up the stairs to see his son. He is the work-obsessed, feverish man we all know, going through a struggle that most of us will, fortunately, never have to know. Redmayne perhaps shines best when Stephen can no longer move nor speak — the audience can see the sadness in his eyes when he understands that he cannot give his wife the passionate love she deserves, and we can sense the shy flirtation between him and his nurse. Jones, too, is excellent, bringing nuance to an otherwise tired trope — that of the strong, determined wife. Jane’s frustration is communicated through Jones’s furrowed brow and hurried vacuuming, and less so through conventional dialogue. In fact, as Hawking’s body slowly deteriorates, the film begins to focus more on her struggles and ambivalence about caring for a husband that has lost the ability to care for her, and I appreciated the balance given to both actors in the marriage. The movie is worth seeing for Redmayne’s performance alone. Like most films, “The Theory of Everything” was not shot chronologically, so Redmayne often had to assume two different versions of Hawking in one day, going from energetic, young Stephen in the morning to wheelchair-bound, immobile Stephen in the afternoon. There is one scene in which Jane is helping Stephen put on a sweater. Their baby begins crying and she tells him she will be right back. Still having partial, but very weak, control over his arm muscles, Stephen then attempts to put the sweater on himself and gets stuck. He laughs, his face hidden within the sweater and his body comically contorted, conveying a mixture of embarrassment, helplessness and hilarity. That was for me the most devastating and most beautiful moment of the film. What happens when a man who can unlock the secrets of the cosmos can’t even put on his own sweater? This is the question that “The Theory of Everything” seeks to answer, and although it does so perhaps too superficially, the performances of its two central actors, who tell us that love endures in ways we wouldn’t expect, make the experience worthwhile. The Theory of Everything is now playing at Amherst Cinema.